Universities partner to provide accessibility through sign language focus. Brazil has a sizable deaf community. One of the greatest challenges is that even though deaf people are born and raised in Brazil, they don’t know Portuguese because they cannot hear or have no linguistic input. This makes learning a challenge for over 5 million Brazilians. 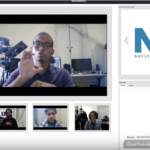 Thanks to the National Institute for the Deaf and a partnership of 12 universities across the country, with online learning, that is changing. 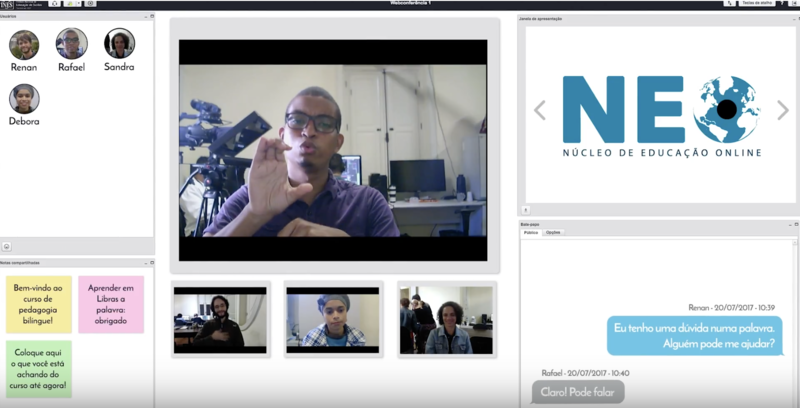 Partner universities have made a commitment to change the experiences of deaf students across Brazil by developing the first virtual learning environment totally in sign language. 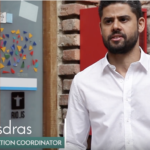 The Bilingual Education hybrid course project aims to train teachers to deliver instruction in bilingual language learning, Brazilian Sign Language and Portuguese. 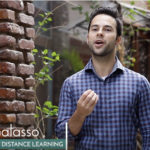 Taking into consideration the linguistic and cultural particularities of deaf people, this course is impacting students across Brazil by training 390 bilingual teachers per year. Not only is this project providing teacher training, but it is creating a repository, a digital database to preserve and disseminate a multitude of educational materials related to deafness. 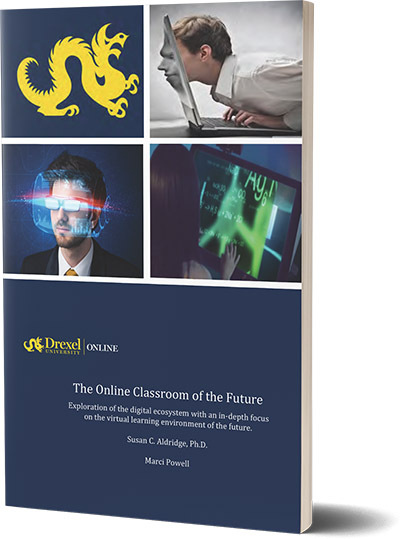 “Our unique platform contains several learning tracks where the pedagogical relations are established through the knowledge networks developed throughout this course. The training activities are based on the interaction and dialogue between students building as a result a multimedia plot full of experiences and connections. 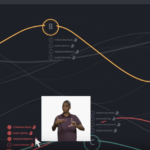 The courses platform is equipped with several tools designed specifically to deaf education being sign language, a visual spatial expression, a mental map allows students to organize their knowledge in a personalized way sharing the multimedia materials in the virtual space. 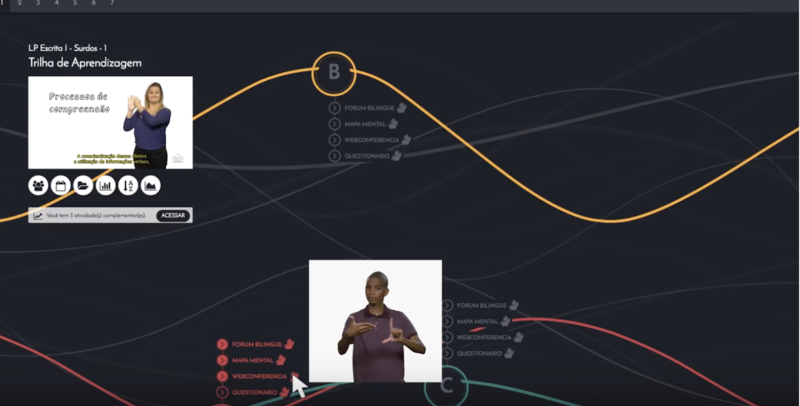 The mental map also allows real-time interactions among students and the possibility of saving the main media in their personal galleries. 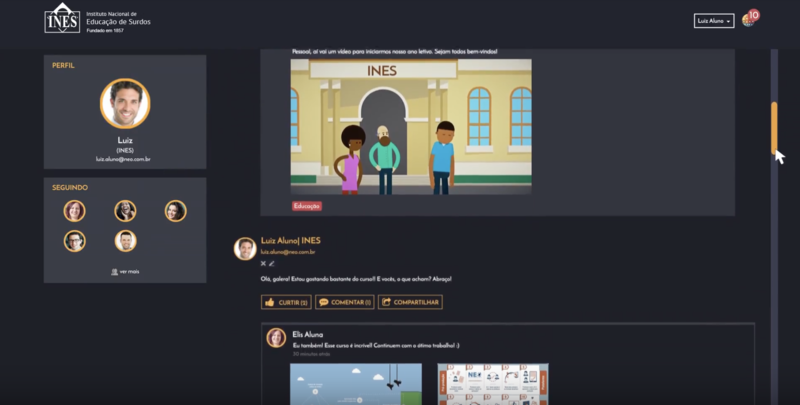 The platform includes a personal learning environment where each student can organize his or her own social network of knowledge and increase the curriculum proposed for the course by taking in animations, infographics, videos, and other materials to enrich the virtual community. 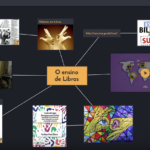 The personal learning environment can also make use of Semantic Web creating tags in the main learning objects and directing students to a personalized digital library that meets their own interest. Our diversified environment also contains game resources that intensify the learning process. 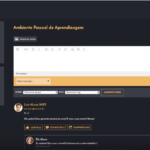 The platform presents a semi adapted module according to the students performance and the tutor may suggest complimentary activities previously stored in the database at any time. It is amazing what a multidisciplinary team of university teachers, educational designers, translator interpreters, and graphic designers can do to impact the lives of over 5 million learners. It’s no wonder the National Institute for the Deaf and this project is garnering award recognition for outstanding work! So often tough challenges bring the best outcomes. This is true for deaf people as they face challenges, particularly in education. The National Institute of Education for the Deaf (INES), headquartered in Rio de Janeiro, is a federal agency linked to the Ministry of Education. INES works hard, as the national reference center in the area of deafness, to eliminate barriers for deaf people. For the deaf student, access to an appropriately trained teacher that know how to adjust pedagogical methodology that is able to sign is rare, particularly in the more remote areas of the country. Having access to learning materials with a component that meets their needs is not always the case. In fact, in takes great care to develop content and digital resources that can be navigated by deaf students. Many teachers don’t know how to deal with deaf people and consequentially the student is put aside to try to learn on their own. Deaf students must become bilingual. 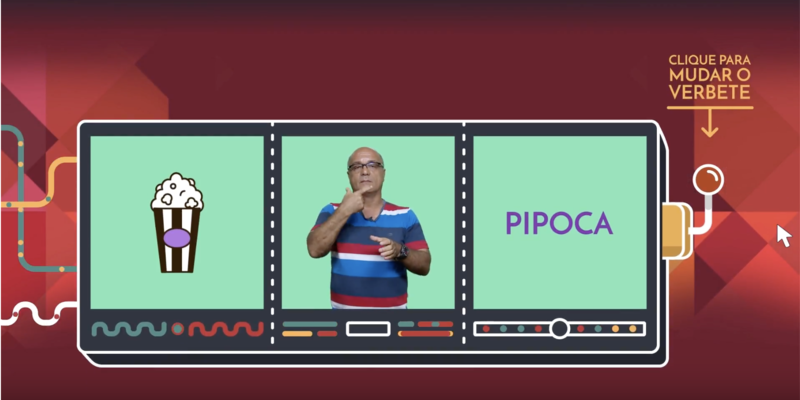 Brazilian Sign Language (Libras) is their first language, and then they must learn Portuguese. It is important to work with the two languages together from the earliest stages of educational development. 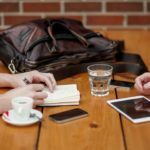 However, one challenge they will encounter as they get older and move toward learning more scholarly content is some missing signs. For deaf students to have access to a high quality education they need proper visual tools and teaching resources that have been adapted. A paper published in Scientific Research titled Deafness and the Educational Rights: A Brief Review through a Brazilian Perspective Studies explains, in greater detail, the dilemma and challenges deaf students face. The authors also point out the need and importance of production of content and teaching materials with significant visual approach. Moreover, they state that gamification and visits to non-formal places are excellent teaching strategies for deaf students. Conceived within the National Plan for the Rights of Disable Personnel – Living Without Limits, a partnership was formed to create an online course focused on bilingual pedagogy in Distance Learning (EAD). 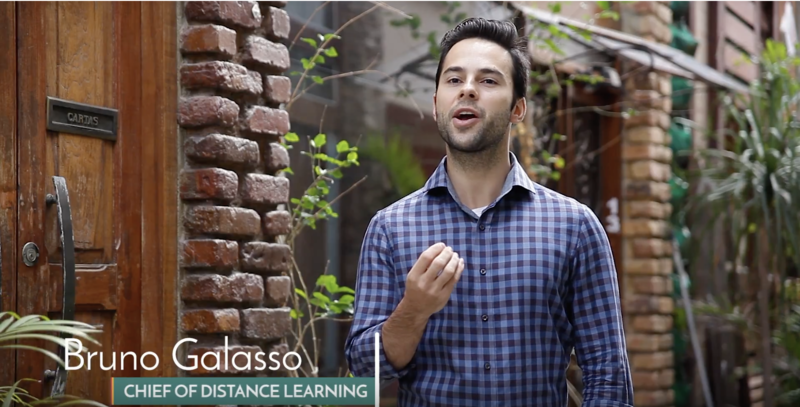 The Bilingual Education hybrid course project is driven by the goal of train teachers so they can adjust their pedagogical approach to better meet the cultural and linguistic specificities of deaf students. 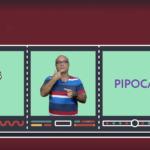 This is the first online bilingual education course done in Brazilian sign language rather than with small translation window in the corner of the screen. Content, materials created with deaf students at the center. 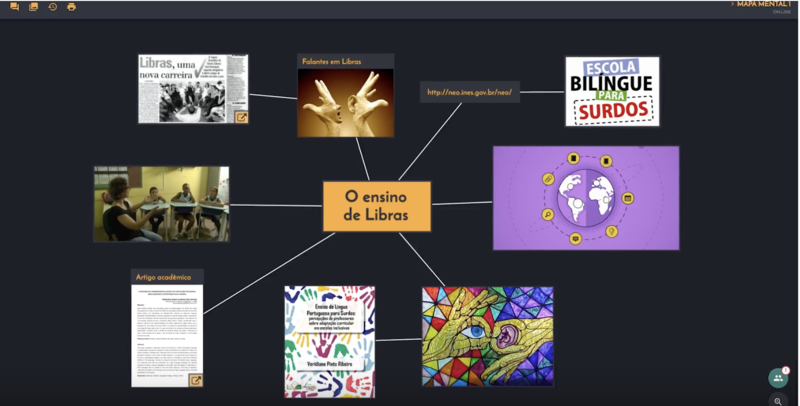 Professors Bruno Galasso and Dirceu Esdras spearhead the project with a multidisciplinary team of graphic designers, educational designers, university teachers, and translator interpreters. 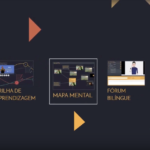 With a personalized virtual learning environment platform approach, the design team created bilingual teaching materials incorporated with digital objects and multimedia tools including a mental map, social network for collaboration, personal galleries where students can store their work. 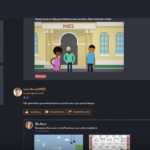 The diversified environment hybrid design also contains a gamification element, animations, a glossary with linguistic variations, videos, and learning tracks for real-time interactions in class and online. 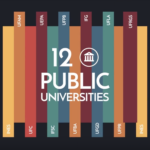 Through the partnership, twelve renowned public higher education institutions (INES, UFAM, UEPA, UFPB, IFG, UFLA, UFRGS, UFC, IFSC, UFBA, UFGD, UFPR) expand the reach across Brazil make it possible cover the five-macro regions of the country. 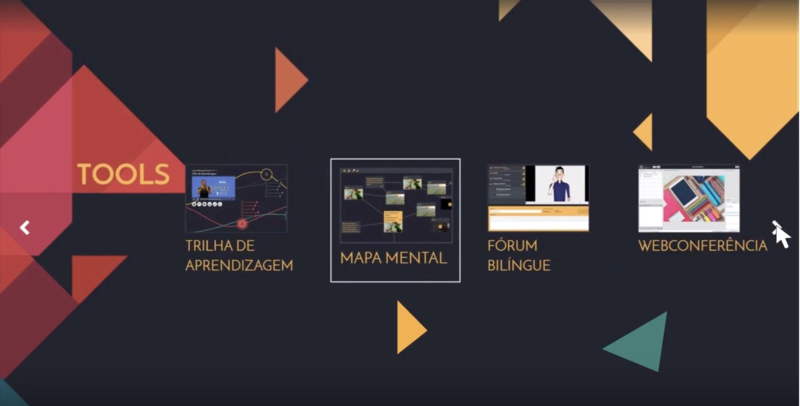 The brilliant concept is potentially serving over 5-8 million deaf people across Brazil. Addressing challenges of this magnitude as a national concerted effort is not easy. However, the project gained the attention of the British Institution Quacquarelli Symonds (QS), a highly respected organization responsible for evaluation and ranking higher education institutions worldwide. 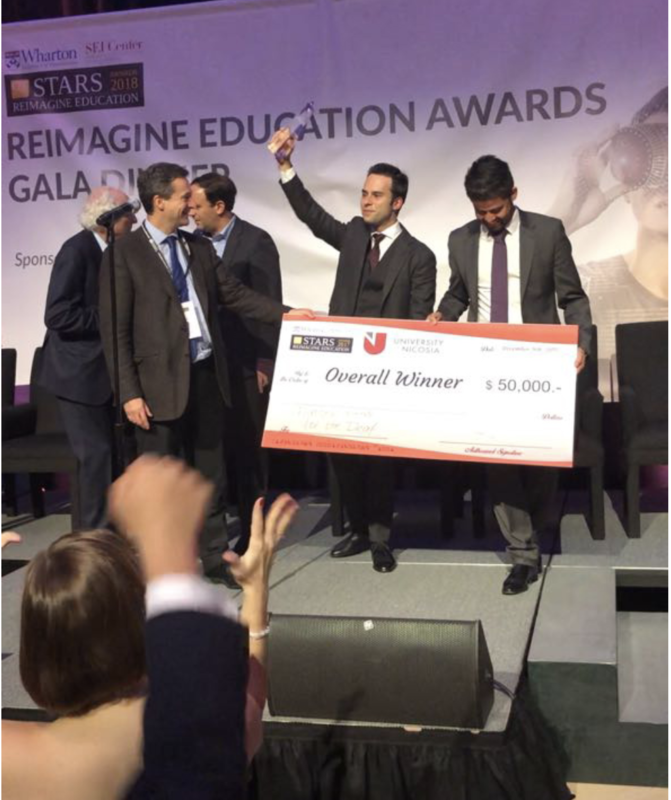 Competing against universities from 73 countries, INES won the overall Reimagine Education 2018 Award in the competition held at Wharton School at the University of Pennsylvania. The prize was $50,000 and $5000 in online technology services. This is quite an honor as they competed against some of the best institutions in the world including Harvard, Massachusetts Institute of Technology (MIT), and Oxford. INES and the other institutions should be applauded for addressing the critical challenge in providing accessibility through an innovative and rich virtual learning environment from which the entire country can benefit.